Collins Big Cat – Where is My School? This is a non-fiction information book about Kim, who tells us about the location of her school. 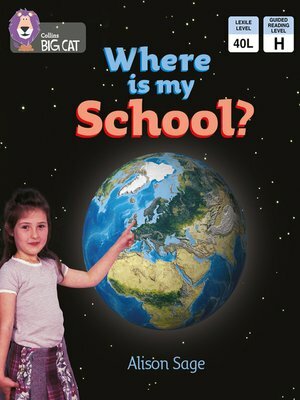 The book shows the exact whereabouts of Kim's classroom within her school, and then expands to locate her school in her city, country and the world. Illustrations include labelled photographs, simple maps, aerial maps and an image of the Earth. • Yellow/Band 3 books offer varied sentence structure and natural language. • Text type - An information book • Pages 14 and 15 include an index, and a visual reminder of Kim's location from her classroom – school – city – country – Earth, which can be used to check comprehension and as a model for further independent work. • Curriculum links - Geography: Around my school.